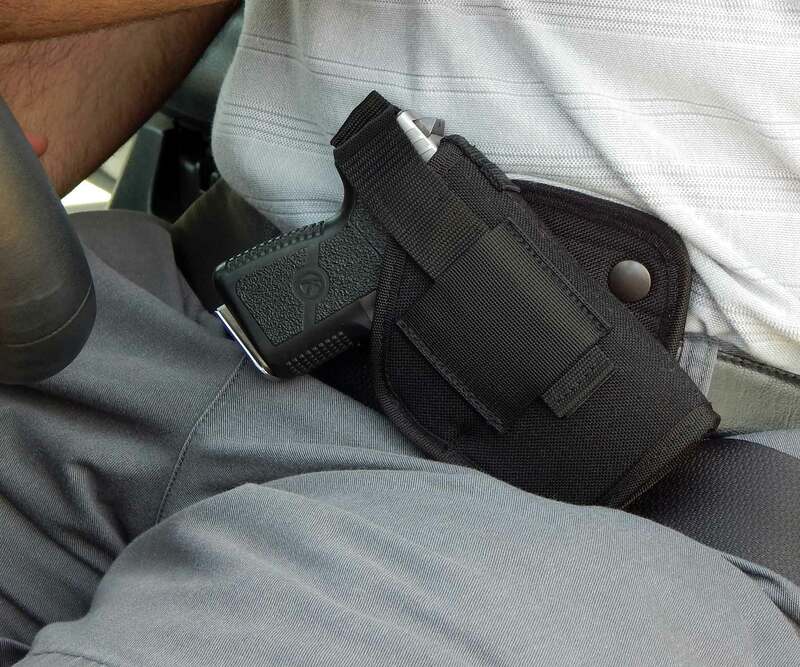 Carry your gun while driving or sitting in the most comfortable, convenient way, while still allowing the fastest draw possible. Having your handgun on your lap or on the passenger seat while driving could be a disaster. One sharp curve, one hard, sudden stop or God forbid if you crash, could send your handgun flying inside your car to land who knows where. 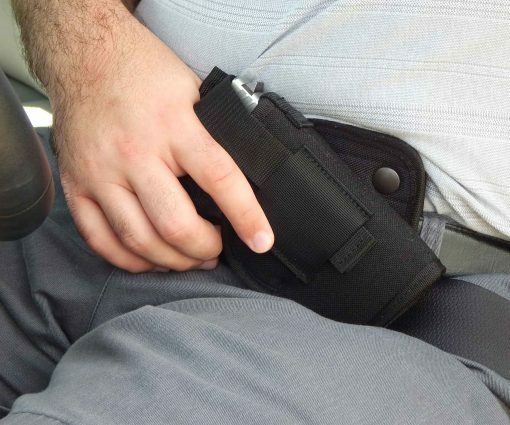 The Driving Crossdraw Belt Holster will secure your gun to your belt and positions your gun for instant access, yet will not interfere with seat belt function. It also works great for anyone who has to sit for any extended amount of time behind a desk. When worn with an outer garment, your gun is completely concealed. 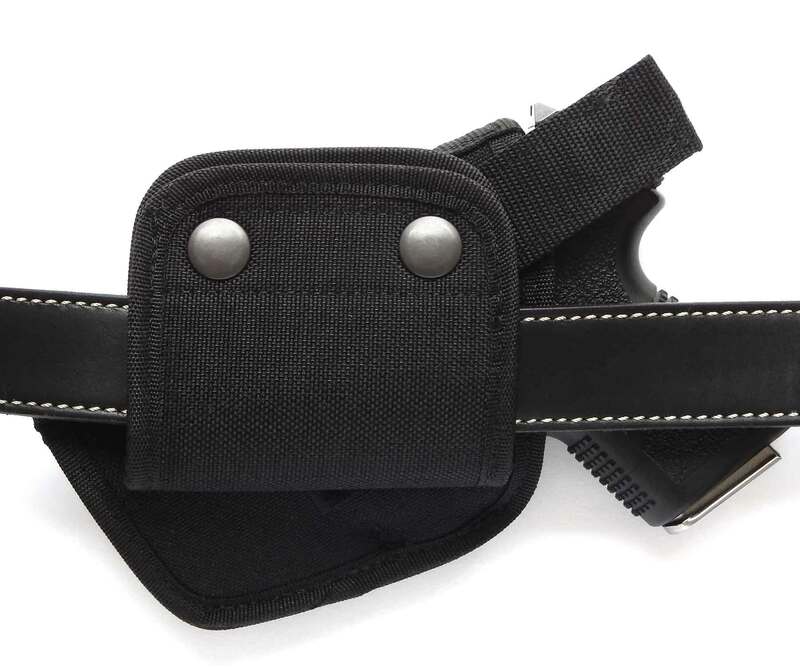 ATTACHED: A flap, on the back of the holster, wraps around your belt to hold the holster in place. It uses quality, heavy duty snap fasteners for easy-on, easy-off without having to remove your belt. BELT SIZE: Fits belts up to 1½ inches. The Driving Crossdraw Belt Holster is a quality concealed carry holster designed for no-nonsense, practical everyday use. This card reveals, step-by-step, exactly what to do after the confrontation ends and the confusion begins. It contains vital information to protect you! If you carry a gun for protection, you can’t afford to be without this card. 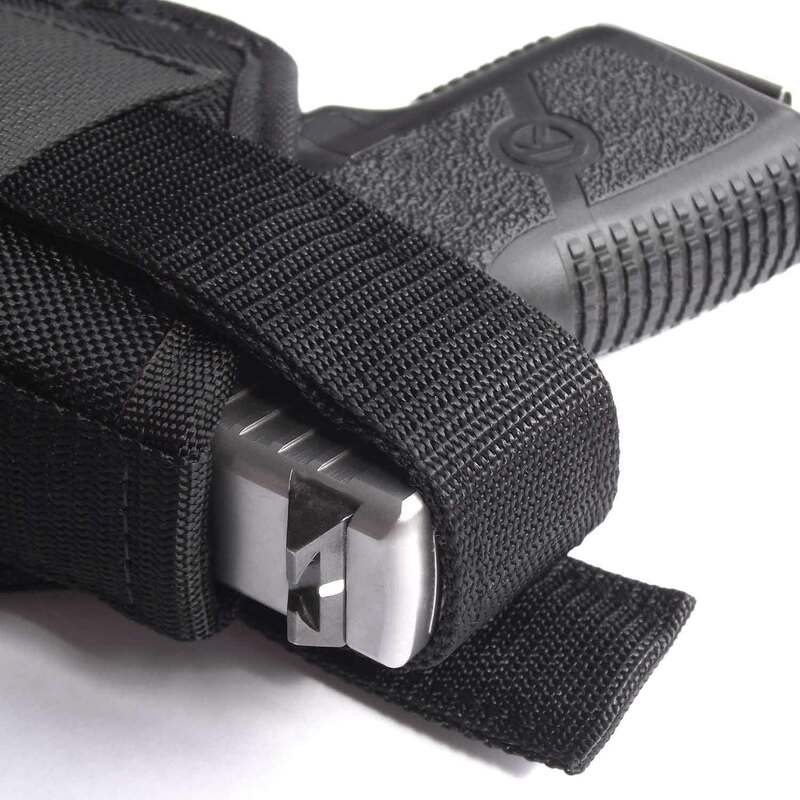 Get your card absolutely free, just by trying the Driving Crossdraw Belt Holster—at no risk to you! 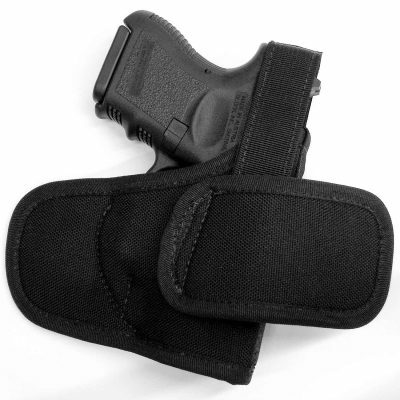 Fits most handguns such as Glock 19, 26, 43, Sig Sauer P365, Beretta, Springfield XDS, S&W M&P Shield, Ruger LC9, Taurus, Kahr, Kimber, Kel Tec, Bersa, Walther, S&W, 380, 40 Auto, 38 special, 45 ACP, 9mm and MANY MORE. Very nice design on my driving holster. Well made, comfortable and fits fine. I wold have given 5 but the belt fit for right draw is way too tight. With right draw it has to fit over two layers of the belt, doable but difficult. I did contact APG about this and they suggested I put the holster on the belt at night to help stretch it out that worked. I can now snap it over both layers of the belt with minor effort. 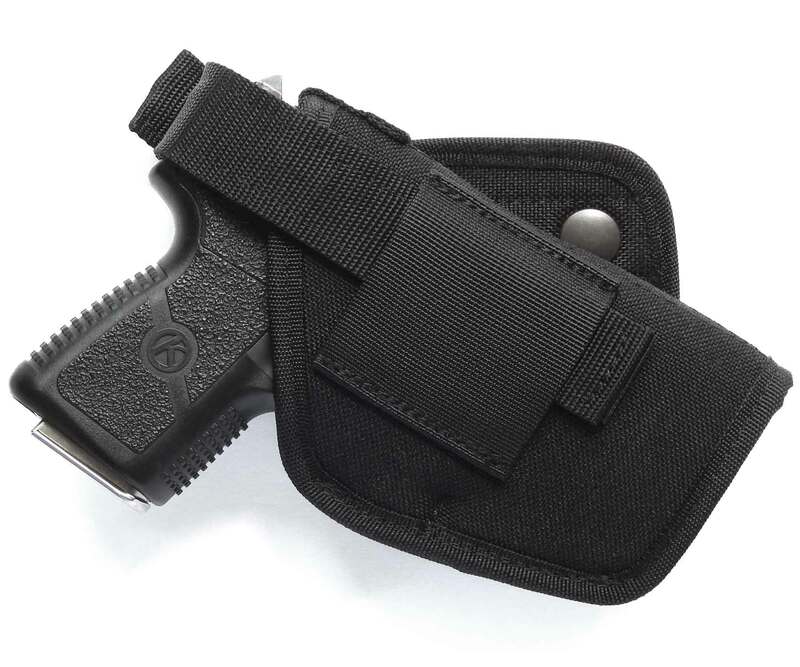 It is very comfortable while sitting (have a desk job) and when worn with a loose fitting shirt it’s consealed as well if not better than IWB holster I have purchased. I would and have recommended to friends. I have tried a few driving holsters and i find that this once positions best for me. Happy with my purchase as the fit is perfect for my SHIELD 9MM. Great fit for my Sig P365. Comfortable and easy to wear. I originally bought the 46-17 driving cross-draw belt holster for my Sig Sauer P320 forgetting that I had a Romeo 1 reflex sight mounted to the rear of the slide. Although at first a little disappointed I found I could still use the holster with my Glock 19 gen 4 – 9mm handgun. I contacted customer service on continued interest on a holster for this Sig Sauer gun and got a immediate reply that the biggest size opening would be a 46-26ct but unfortunately with this sight there would be a lot of rubbing on the sight. I am well pleased with Active Pro Gears products, their quick delivery and professional response from customer service. Good fit for my Glock 19, comfortable and reasonably priced with fast free shipping. Highly recommended. This holster is top notch. Carries my PM9 perfectly. Highly recommended have two sizes and no complaints. Does just what it advertises. Good value for the money. Comfortable and fits my gun well. Comfortable and holds gun good. I can honestly say this is one of the best holsters on the market. 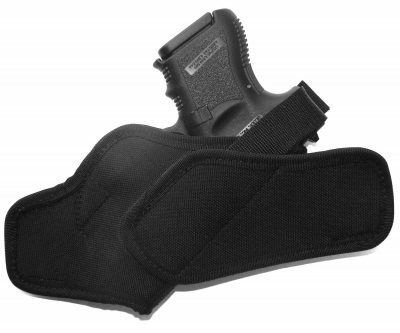 This holster is comfortable and light, holds gun nicely and conceals. Perfect for my needs. Spend a lot of time driving? 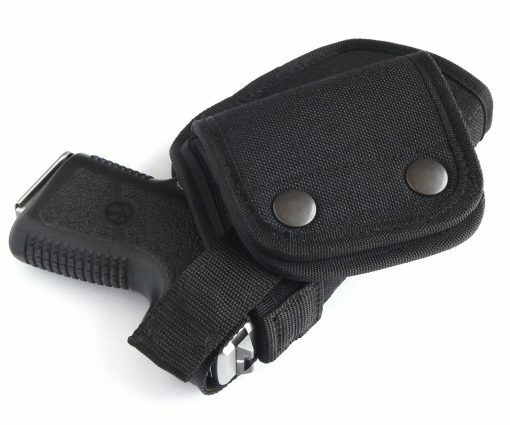 Look no further buy this holster. I am glad i did! this is my second one and they are the best. I will give it five stars, It was a great fit for my (Springfield XDS) the tie down strap was easy enough to install and adjust, I don’t think you’ll ever used the snaps to hold the holster to your belt, probably run the belt through the holster and put it on. Great design for us fat boys with a beer bellies who absolutely can never wear an inside the belt holster. 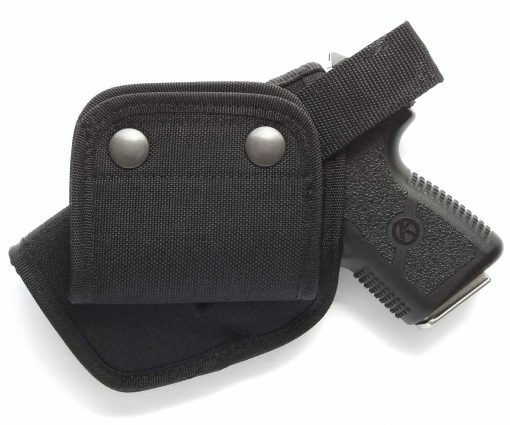 This holster is a winner. I wish it was a little thinner, but I give it a solid 4. fits nice and holds secure. Very good for its intended purpose. I tend to use it when not driving it also. Only grip is snaps on top. They haven’t failed but wished they were situated on the bottom. Perhaps it just paranoia of them failing and holster dropping secondary to gravity. I keep it attached to the lap belt in my car. Pistol sits comfortably on top of my thigh.